The eel is currently facing a plethora of obstacles when trying to enter and exit the sea. The European coast is heavily guarded by heavily engineered coastal defences. The small numbers of young eels that manage to make their way through these barriers then face numerous water management and unscreened pumping stations, while navigating their way through fresh inland waterways. Here the young eels will have to survive 3 to 15 years, depending on the European Region they grow up in, before they can head back to sea. Once they start the return migration, their journey is repeatedly hindered by the same dangerous barriers. European countries restrict and limit their fishing in many ways including local catch quotas and the restriction of sales to within the EU. This is one of the ways Europe tries to re-establish a healthy recovering eel population. These efforts for natural growth are thwarted by the numerous man-made barriers the eels face while trying to fulfil their lifecycle. Besides that, there is a lack of financial investment for unblocking the migratory pathways. 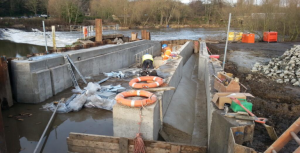 All over Europe there are different projects emerging that help the eel evade an early death in a water turbine, however these projects consume substantial budgets. At this point the number of project are insufficient, and unblocking all migratory pathways will only be a long term plan. Looking at the migratory pathways in, it’s important to have a short term solution, in order to help as much eels as possible to conquer the barriers. That is why ESF helps young eels on their way into fresh water by restocking initiatives. 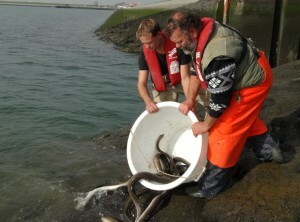 On the way out, when eels face similar difficulties, fishermen are paid to increase silver eel escapement, in trap-and-transfer-programs, so-called “eels over the dykes”. The Eel Stewardship Fund helps both during the restocking- and the trap & transport-phases of the eel’s migratory path on the short term. For the long term solutions, the ESF provides both knowledge and financing for eel conservation projects throughout Europe.